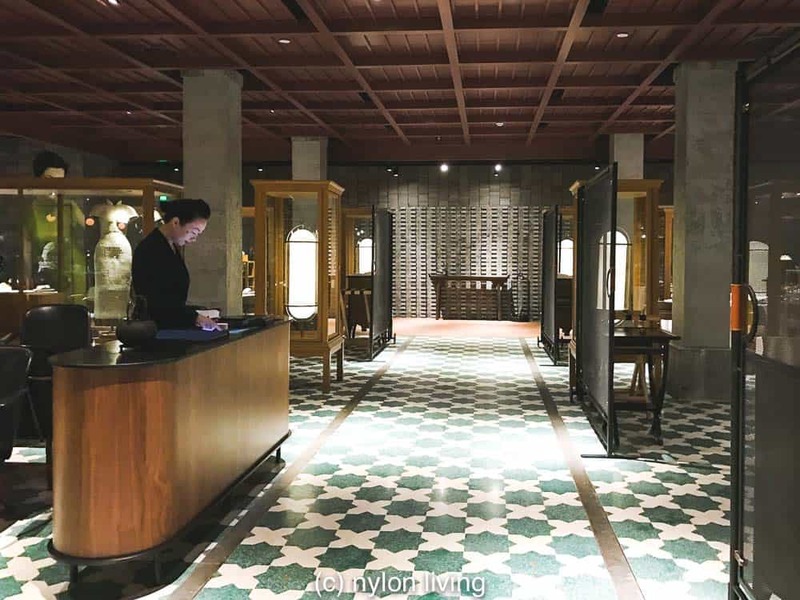 The Canton Table Restaurant in Shanghai may have recently opened in December 2016 but it has had a long history as a Bund Shanghai restaurant serving up fine Cantonese cuisine. The predecessor to the Canton Table Shanghai, at the same location on the Three on the Bund building, was the Whampoa Club Shanghai. The name got changed as well as the interiors but luckily this Shanghai restaurant is just as good. 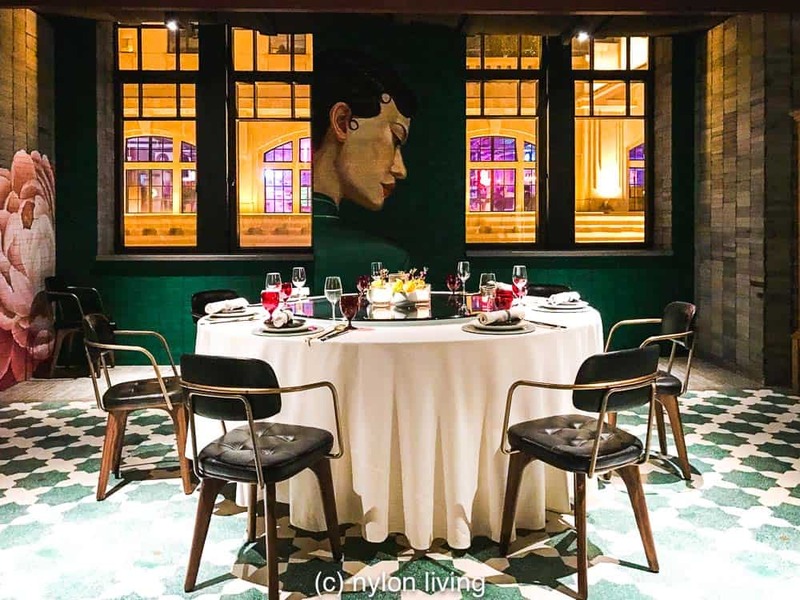 The recent renovation of Canton Table’s interior has changed the glamour factor of one of the best Cantonese restaurants on the Bund Shanghai with a skilful mixture of Art Deco elements paying homage to the Bund’s historical heyday together with contemporary warehouse styling. Throw in some amazing views of Shanghai and you’ve got the full package! 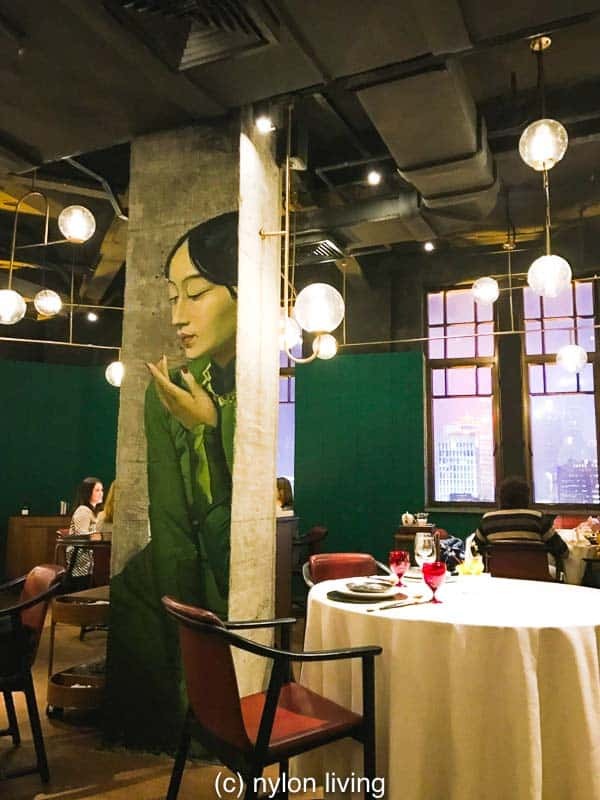 The large paintings on the walls evoke the busy street scene during Shanghai’s glamorous heyday in the early 20th century. At Canton Table Shanghai, interspersed in between the oversized images of people are flowers. The panelled wood ceiling adds warmth to the space which is otherwise dominated by grey concrete tiles and pillars. Tinkly music seems to be standard in Chinese restaurants and Canton Table Shanghai was no different. As my daughter noted, the tinkly music though seemed to be more of an electronic version in deference to the trendy atmosphere. I loved the combined use of cement tiles, wood and warehouse features. 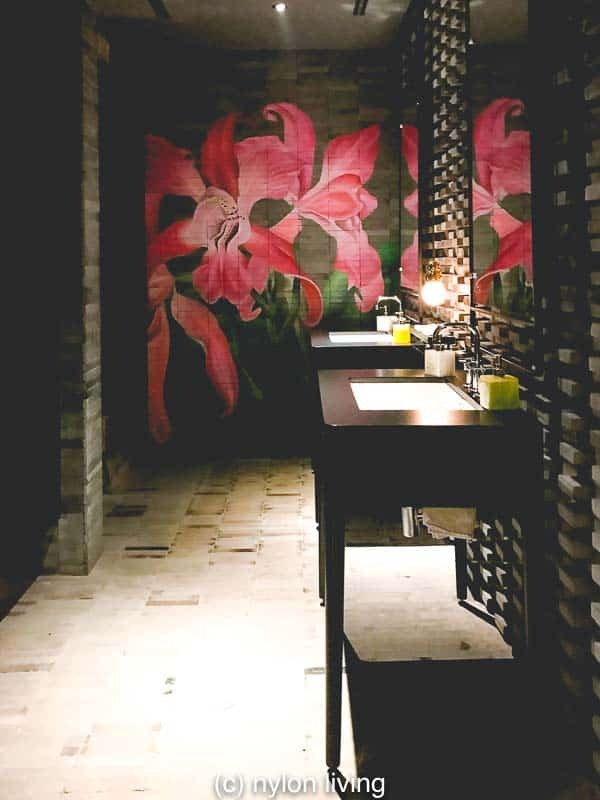 The restaurant has walls painted with oversized flowers on a concrete tile background. 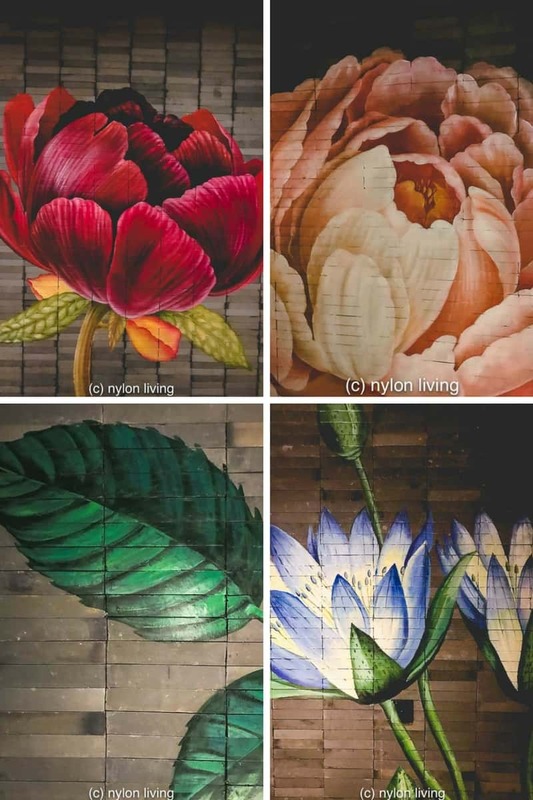 The oversized flower art dominates the space. 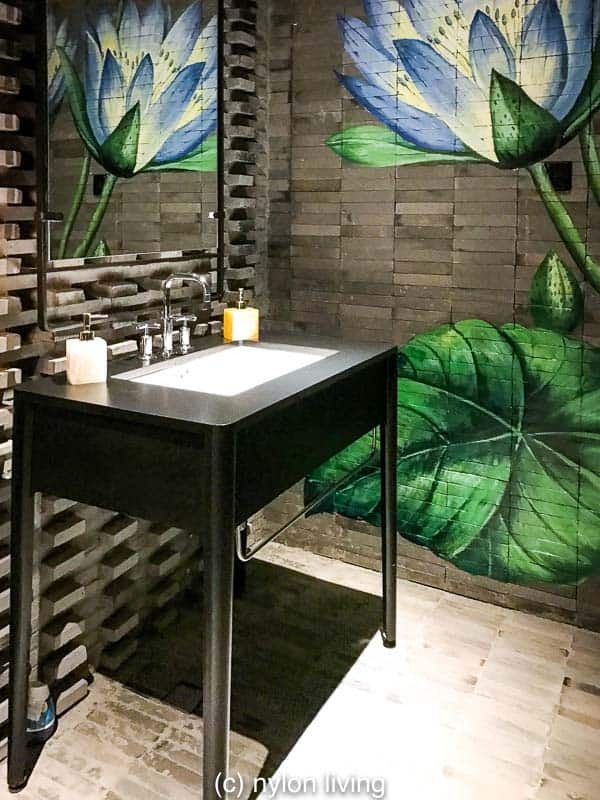 The furniture is simple and modern letting the interior artwork and the exterior views take center stage. This dining chair pays homage to a classic Wegman Wishbone chair. 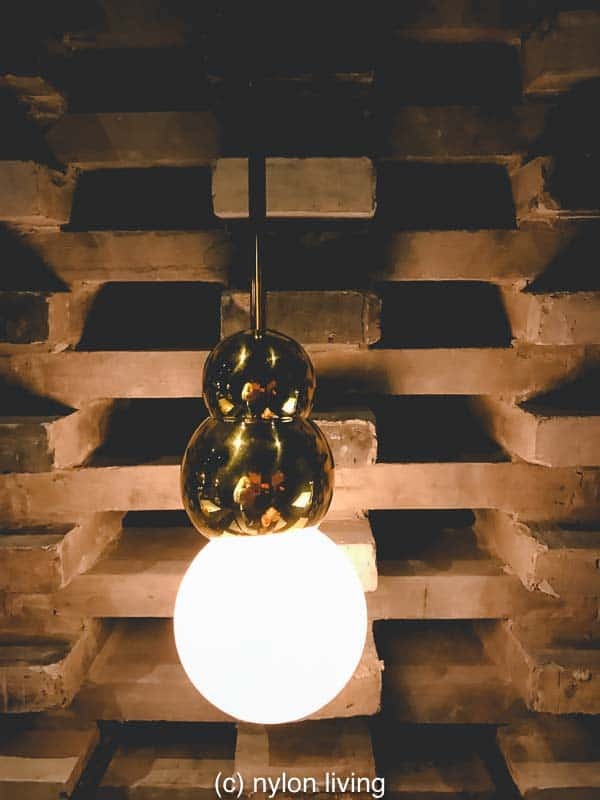 I remember these lights from Sosharu, the now-closed Jason Atherton Izakaya-style restaurant, in trendy Clerkenwell in London. We were presented with a menu the size and heft of a book! The names and descriptions of the food was accompanied by photos which helped us decide. 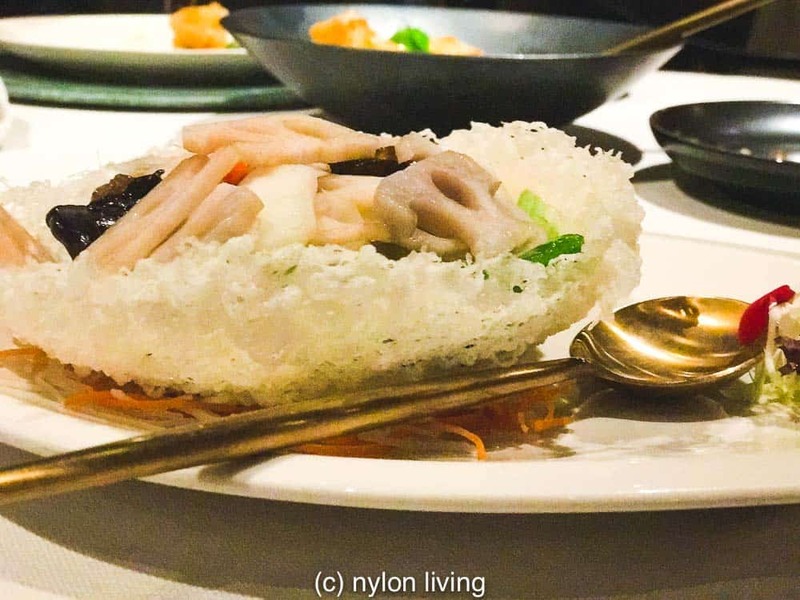 In Shanghai Canton Table clearly has decided that a hefty menu will automatically elevate to top status among the Cantonese restaurants in the Bund. The menu is the size of a book! There is an a la carte menu as well as a dim sum menu. We went with a la carte and ordered standard dishes you’d find in other Cantonese restaurants on the Bund such as barbecued pork, stewed beef cheek and sautéed shrimp. Once again, I saw that pig trotters were on the menu at this Shanghai restaurant! And, once again, we gave the pig trotters a pass. The Canton Table menu is available online if you would like to look for yourself. Note the masterful mix of colors on the table as well as the presentation of the food. Nothing is too matched in terms of plates, glasses or cutlery but it all goes together harmoniously. The chef at Canton Table Shanghai has decades of experience in professional kitchens and we were delighted with all of our dishes (a rare occurrence). The food is not only delicious but well presented. 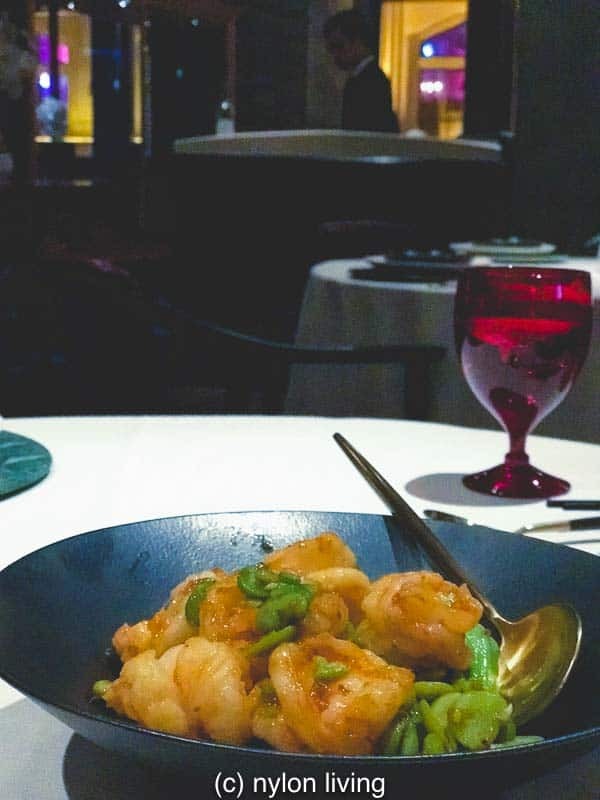 The restaurant is family-friendly while still being sophisticated, stylish and serving fine Cantonese food. When my children arrived at the restaurant, they were given a traditional Chinese sugar art lollipop which they loved. There were other families with children at this Cantonese restaurant on the Bund. We noticed this trend in other fine dining restaurants in Shanghai. People came out with their school-aged children to eat dinner in many a nice Shanghai restaurant. It helps that Canton Table opens at 5:30 so that you could have an early dinner as well. As for the food, even my fussy eater child, not only found dishes she would eat but also enjoyed her meal. In Shanghai, Canton Table is a superlative experience for family-friendly fine dining on the Bund! There is a bar area where you can sit if you are just having drinks. The drinks menu is standard. You should note that the wines in China tend to be more expensive than cocktails. My husband stuck to the Oriental Negroni which was made with hongmaioyaojiu and China Sprit (and hence the Oriental part). The other cocktails at this Shanghai restaurant were quite creative combinations, too. For example you had the Drifting Dream (Chinese yellow wine, drifting date, ginger, lychee and tangerine) or the Imperial Beauty (rum, jasmine and peach). At Canton Table, the kids and I had mocktails named after the seasons. You can see the summer, autumn and winter drinks below. 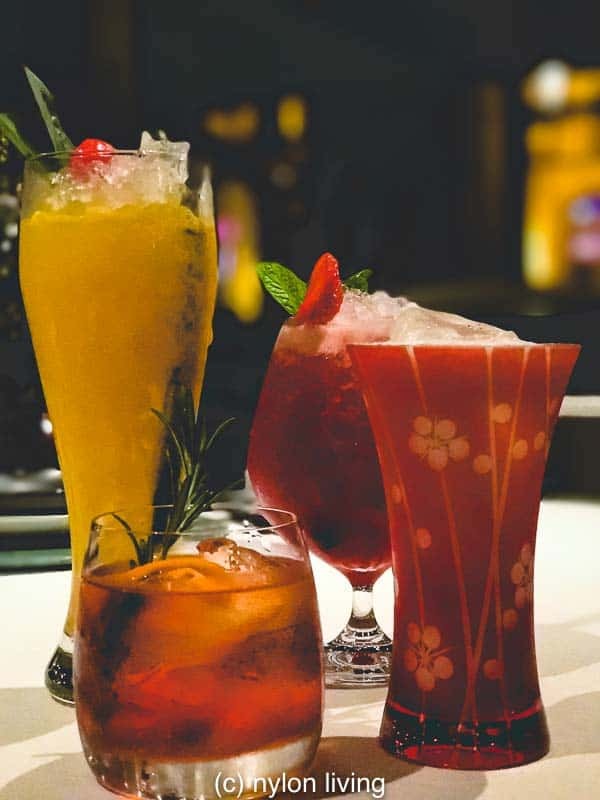 So what are in the four seasons mocktails? Summer (hiding in the rear below) is strawberry, raspberry, cranberry, lemon and soda; Winter (in the pretty glass) is coconut, pineapple, lemon and cinnamon and Autumn (on the left) is pineapple, mango and passion fruit. I thought briefly about trying the spring mocktail just to round out the set but I liked my winter mocktail too much to change! Spring was a combination of lemon, cucumber, basil, elderflower, and soda. The Canton Table joins several other restaurants on the Three on the Bund building. Taking over the entire fifth floor of 3 on the Bund, Canton Table is a large space accommodating many diners. It’s enormous size meant we were able to get same night reservations relatively easy though our concierge at The Fairmont Peace Hotel. 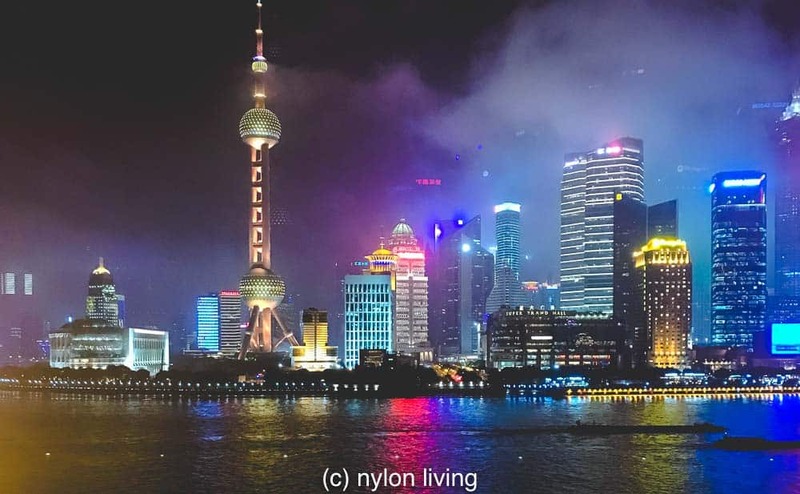 The panoramic view from the windows of Canton Table over the Pudong in Shanghai are worth the price of admission (especially at night!). It’s a light show in itself and will entertain the children endlessly. On the other floors of Three on the Bund, you have some of the best restaurants on the Bund Shanghai. For example, acclaimed 3 Michelin started New York chef and restaurateur Jean Georges Vongrichten has 2 restaurants taking up two floors in this building. There is his eponymous French restaurant which first opened in New York, Jean Georges, on the 4th floor and his Italian restaurant. Mercato, on the 6th floor. 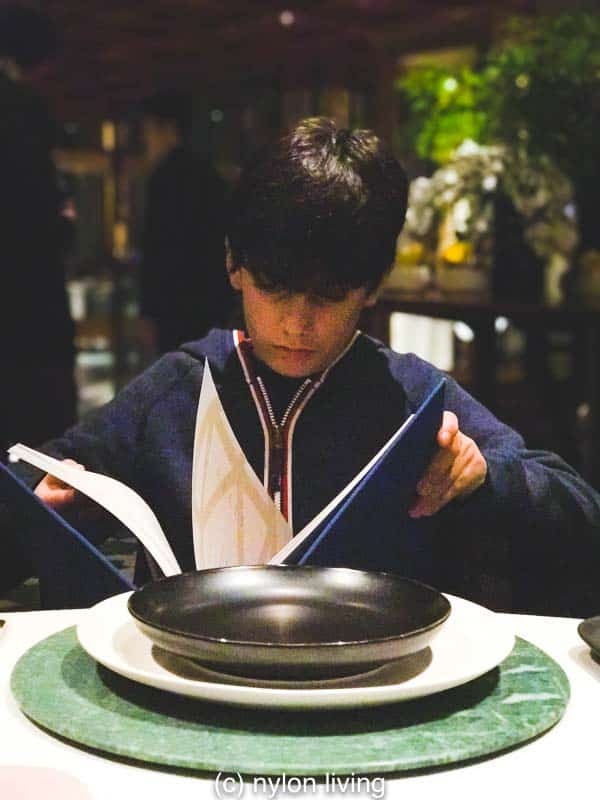 My kids were impressed to see Jean Georges because the New York restaurant gets name checked in one of their favourite movies, Mr. Popper’s Penguins (2011). This Shanghai restaurant is open for lunch on Monday through Friday and brunch on the weekends. We realised that Shanghai has a brunch tradition that is similar to that enjoyed by the cosmopolitan crowd that gather in New York City cafes and the hotels of the UAE. Canton Table is open for dinner from 5:30 pm every evening every day of the week. 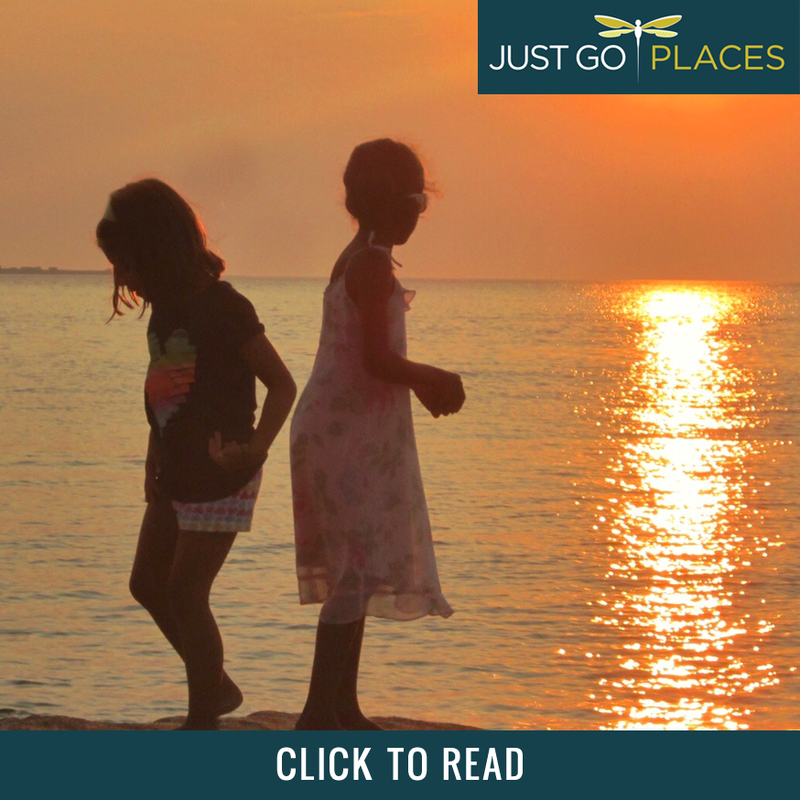 Tip – If you want to eat early for dinner because you have tickets to a show, or are eating with the children etc. 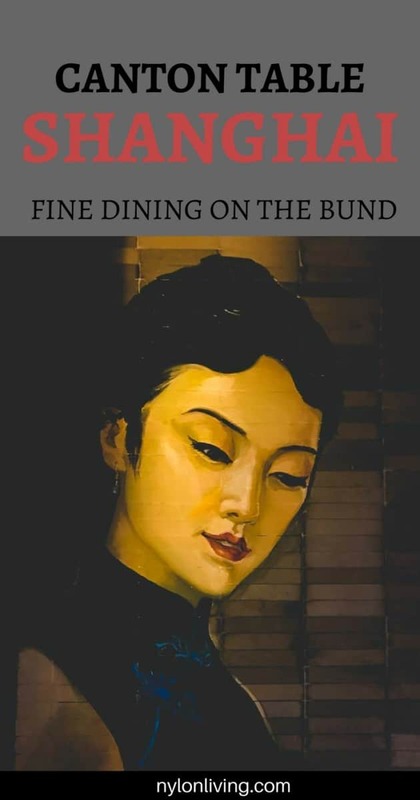 at a Bund Shanghai restaurant, the Chinese restaurants open at 5:30. So it’s a good idea to choose among the Cantonese restaurants in the Bund. The other top restaurants on the Bund Shanghai that serve non-Chinese cuisine tend to open at 6:00 pm for dinner.